In this pAsuram, mAmunigaL is following AzhwAr’s pAsurams of praising those who serve emperumAn and despising those who do not serve emperumAn, and is mercifully explaining it. How is that done? 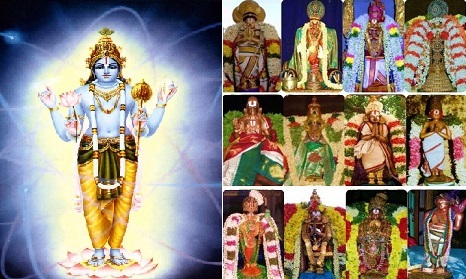 Having served emperumAn through his speech and becoming blissful, AzhwAr despises those who simply nurture their body ignoring such service to emperumAn, and joyfully praises SrIvaishNavas who serve by singing, dancing etc as an outlet to their internal experience enjoying bhagavAn in thiruvAimozhi 3.5 “moymmAm pUmpozhil“; mAmunigaL mercifully explains this starting with “moymbArum mAlukku“. moymbArum mAlukku – For sarvESvara who is abundantly glorious due to having the entire cosmos as his form. It was due to his omniscience and omnipotence that he mercifully accepted the service of the elephant (gajeEndhrAzhwAn) after freeing it from the crocodile in the pond [1st pAsuram]. mun adimai seydha uvappAl – Previously in thiruvAimozhi 3.4 “pugazhunal oruvan“, AzhwAr performed vAchika kainkaryam (service through speech) and became blissful. anbAl AL seybavarai Adhariththum – Praising those who serve with devotion. That is, as seen in “Odhi uNarndhavar” (those wise ones having studied SAsthram) [5th pAsuram], “munivinRi Eththik kunippAr muzhudhuNar nIrmaiyinAr” (those who praise without hatred, dance with somersaults are having the nature of knowing all SAsthrams) [6th pAsuram], “Arvam perugik kunippAr amarar thozhap paduvARE” (devotees who dance around doing somersaults with abundance of enthusiasm, will be glorified by sUris who are eternally enjoying bhagavAn) [8th pAsuram]. It is said in SrI rAmAyaNam sundhara kANdam 61.14 “gAyanthi kEchith, praNamanthi kEchith, nruthyanthi kEchith” (some of the monkeys sang, some offered salutations, some danced). anbilA mUdarai nindhiththum mozhindharuLum – Scolding those ignorant fools who are devoid of bhakthi. That is, as seen in, “ezhundhum paRandhum thuLLAdhAr thammAl karumamen” (please tell, what is the purpose of those who do not speak with the mouth, sing, flying high without having the feet touching the ground instead of being seated and jumping up and down doing somersaults?) [1st pAsuram], “maN koL ulagil piRappAr valvinai mOdha malaindhu” (will be born in this world which is having abundance of soil/land, to be smashed on the ground, being inflicted with the great sins which are difficult to exhaust) [2nd pAsuram], “alai koL naragaththazhundhik kidandhuzhaikkinRa vambar” (those who never lose their freshness, are drowned (so they cannot reach the shore) in the great hell which is having many sorrows and stay there suffering) [3rd pAsuram], “tham piRappAl payanennE sAdhu sanangaL idaiyE” (what is the use of being born amidst sAthvika sangam) [4th pAsuram] and “en savippAr manisarE” (what will those men chant?) [5th pAsuram], “uththamargatken seyvAr” (what purpose will they serve for the best bhAgavathas?) [7th pAsuram]. As said in sudharSana manthram “mArgam pradharSaya” (show the path towards vishNu), those who have not entered this path are explained to be secondary. mARan pAl … – Oh heart! Engage in great devotion towards AzhwAr who scolded the ignorant ones to stop them from engaging in misdeeds. This entry was posted in Other, thiruvAimozhi nURRandhAdhi on December 29, 2018 by Sarathy Thothathri.